RIT provides an e-mail address and account for all students, faculty, and staff. This e-mail account is created when you receive an RIT Computer Account. Your RIT Computer Account has at least one e-mail address associated with it. Depending on the options you have set up at start.rit.edu, you may have more e-mail addresses. If you set up personalized (students/faculty/staff) and/or named-based addresses (faculty/staff only), these additional addresses merely point to your RIT Computer Account. You can also make your @rit.edu forward to a different e-mail system, if you choose. NOTE: Personalized and name-based e-mail addresses do not provide you with additional accounts, login usernames, or e-mail storage. If you need to save and or backup your emails, Outlook provides a simple way to store them in what is called a .PST on a PC and an .OLM on Macs. A .PST or .OLM are compressed files that contain your emails and can be reopened on a different computer within Outlook. This can be useful when your computer is upgraded or when you need to keep emails for a long period of time, but don’t want to clog up your inbox. To create a .PST or .OLM (also called an archive), follow the steps from Outlook 2013 on Windows and Outlook 2016 on Mac. All faculty and staff are automatically joined to the RITSTAFF mailing list for general campus access. If you want to leave or rejoin the RITSTAFF mailing list, contact the ITS Service Desk at x5-4357 for assistance. Learn more about setting up delegates and accessing shared calendars. The Google Apps at RIT service is an opt-in service for your RIT Computer Account. Faculty/Staff can manage this at start.rit.edu. By opting-in to Google Apps, you will have access to Google Docs and Google Drive. You also must agree to only use your Google account for RIT business purposes, follow RIT code of Conduct for Computer Use and RIT Network Acceptable Use Guidelines, and agree to the Google Apps for Schools Terms and Agreement. How do I set up Outlook on my computer? How do I get my RIT e-mail on my phone? How do I access my RIT e-mail easily from any computer? I don't like Microsoft Outlook. How can I get my RIT e-mail in another program? You'll find the set-up information for other e-mail programs in our Exchange Mail Client Quick Reference Guide. Your RIT e-mail address is based upon your RIT username. You use your RIT username to login to the RIT user systems. Usernames are not e-mail addresses; usernames usually looks like "abc1234" (for students) or "abcits" (for faculty/staff). An example of an email address would be abc1234@rit.edu. 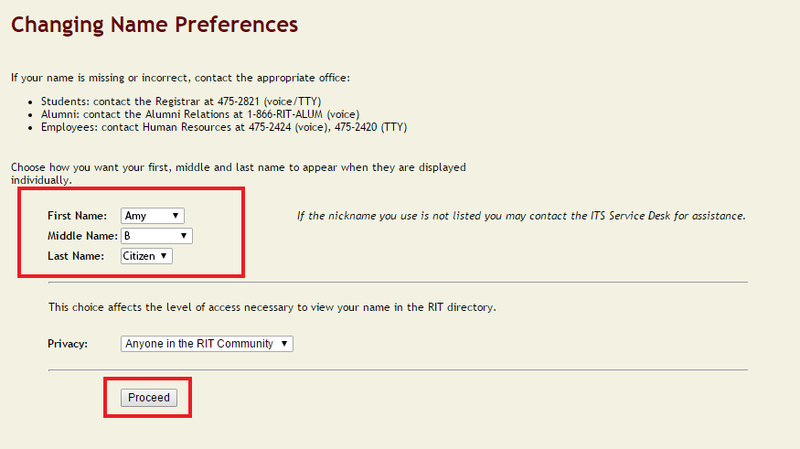 You can set up a personalize RIT e-mail address at start.rit.edu/MailPreference. Enter your desired personalized email and scroll to the bottom and click Change my E-mail Settings. The "@mail.rit.edu" portion of the address is required, so that the personalized e-mail addresses do not come in conflict with regular RIT accounts whose e-mail addresses end in "@rit.edu." Your faculty or staff account allows another address, based on your real name. The address will be created based on your identity preferences, which are set at start.rit.edu. 4. Select your name preference you want from the drop down. Click proceed when you are done. Once you set up a name-based e-mail address for your account, it is suitable for putting on correspondence, stationery, and business cards. If you have chosen to forward your e-mail to a different e-mail system, then the three addresses described above will all forward to that outside e-mail system. You may turn mail forwarding on and off at start.rit.edu/MailPreference. Some departments at RIT have chosen to operate their own mail systems -- either now or at times in the past. If you are using one of these systems, you should be aware that they are not necessarily linked to your RIT computer account (or its associated e-mail addresses). However, you can provide a link by making sure that your @rit.edu mail is forwarded to the mail system you actually use. That way way, any mail sent to your @rit.edu address gets to where you actually read your mail. 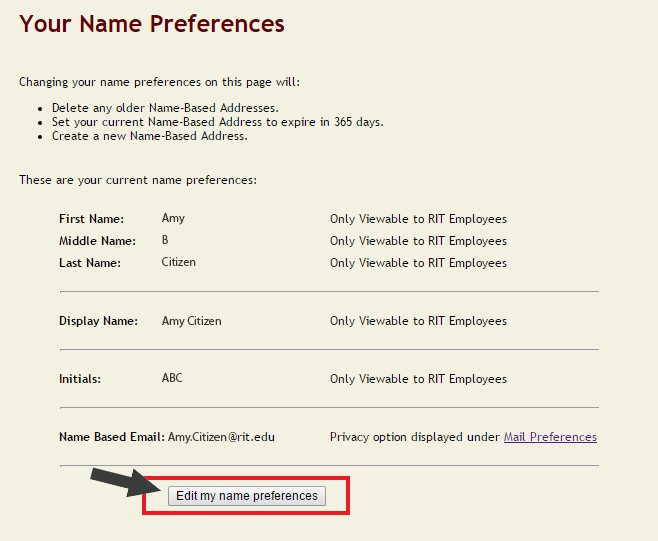 So, we strongly recommend that you update your identity and e-mail preferences at start.rit.edu. You can set mail forwarding to send your @rit.edu mail to the other mail system. Why? This will let others who are using the campus-wide mail system find you to send you mail, if needed, through the on-line RIT Directory. It will also allow some official RIT mail to reach you properly at your @rit.edu address, even if you aren't reading mail from the main RIT system. This will help provide more seamless communication with the rest of the Institute. Again, even in these circumstances, we recommend that the address you publish in the RIT Directory be your basic e-mail address (like "abcits@rit.edu"). This does not affect the behind-the-scenes forwarding of your mail to the other system, or delivery of mail from those people who choose to send messages directly to your e-mail address on the other system. 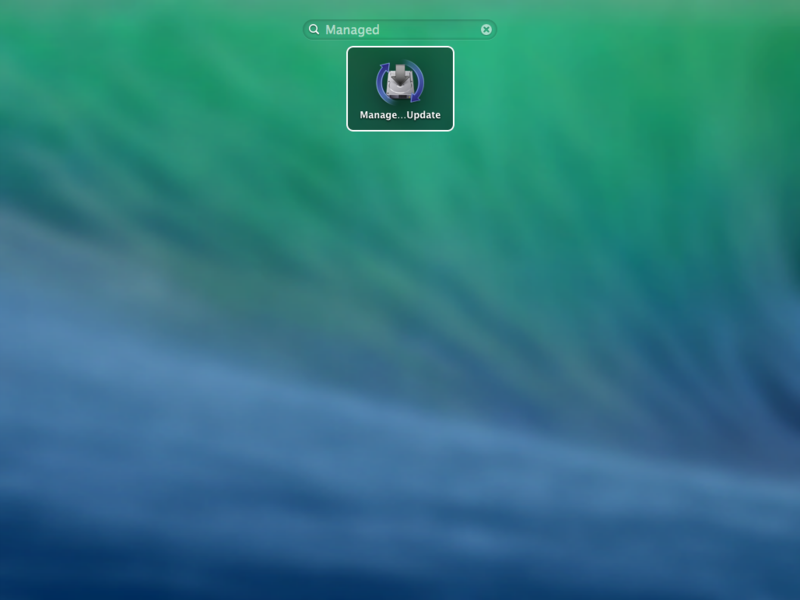 This includes Outlook, Entourage, and many mobile devices (such as Apple iOS and Android). Choose "Exchange" or "Corporate" as the e-mail account type when creating it. We suggest the use of the IMAP mail protocol only if your device or client does not support Exchange. A mail program, when set up for IMAP communication, will maintain a live link to your RIT mailbox. It is rare to find an IMAP mail program that does not also support an off-line mode as well as the live link to your mailbox. An off-line mode lets you read and compose e-mail even when you are not connected to the Internet - and then synchronize when you can connect again. That keeps your computer's understanding of your mailbox in sync with what is currently on RIT's servers. NOTE: Some Internet Service Providers (ISPs) block outgoing mail traffic unless you use the ISPs mail servers. You may see this as a "relay error." If you are unable to use RIT's outgoing mail servers (see above), check with your ISP to determine the correct settings for outgoing mail on their network or connect to the RIT virtual private network.